There’s no shortage of good quality craft beer flowing from the taps of multiple bars and restaurants in South Norwalk. On the flipside, Washington Street has seen a few brewpubs bomb. Now there’s a new beer bar on the block, and before you scoff, and say to yourself, “Really? Another one?” let us tell you what’s different about Spigot Beer. The first thing you’ll notice is it’s in SoNo, but just slightly out of reach of the main drag. Then you must find it. At least four people saw a photo I posted, some who live on the same street, and still had no idea where Spigot is located. It’s across from the post office and Klaff’s, at the very end of the strip of stores that houses Nagoya, right before the Webster Lot entrance near the front of the 50 Washington Street building. You’re welcome. Spigot is owned by Jennie Bedusa, a television producer, and Smith Reynolds, a former beer bottle pallet stacker, then bottling manager at Magic Hat Brewing Company. The couple met while they attended the University of Vermont, a state where craft beer reigns supreme. According to Reynolds, Otter Creek Brewing (Middlebury, VT) got him into the beer scene, specifically their Copper Ale, his introductory craft favorite. The two lived in California for a while and one of their Sunday afternoon rituals was to seek out breweries and bars in the Greater Los Angeles area. Fast forward to present day Fairfield County, where Bedusa was raised (Westport). “We knew we were moving here to be closer to family, and we’ve always looked to open a place like this,” said Reynolds. Combine their beer love, the move to Connecticut, and Bedusa’s father owning the space at 17 Washington Street, a year of planning and construction (done entirely by Reynolds), and Spigot Beer was born. Spigot’s goal is to showcase rarer, east coast brews (with a few draft lines reserved for breweries a little further out), and a constant rotation of fresh beer. Their 12 taps since opening have featured Kent Falls Shoots, a couple different choices from SingleCut, various beers from Sloop, and even Off Color Brewing’s Le Woof. Spigot is great for tasting a bunch of different beers. If you’re into sampling, they offer 5oz pours, generally for $4 or $5, or 12 or 16 oz glasses if you want a more substantial amount, usually around $7-$10 depending on the size and beer. Additionally, if you REALLY like something, you can take home fresh draft beer in a 16 oz sealed crowler for $9 or $10. Soon, you can expect an expanded selection of cans and bottles with Belgian imports included in the mix. Spigot also makes sure to have cans of cider and wine for non-beer geeks. As far as food is concerned, Spigot does not have a kitchen. Aside from the complimentary pretzels at the bar, they do sell cheese boards. The fromage comes from the popular Murray’s Cheese out of NYC, who receives a draft list from Spigot and matches the list with appropriate cheeses for your pairing pleasure. Spigot may soon expand snacks to include chips, jerky, or other beer-friendly bites. 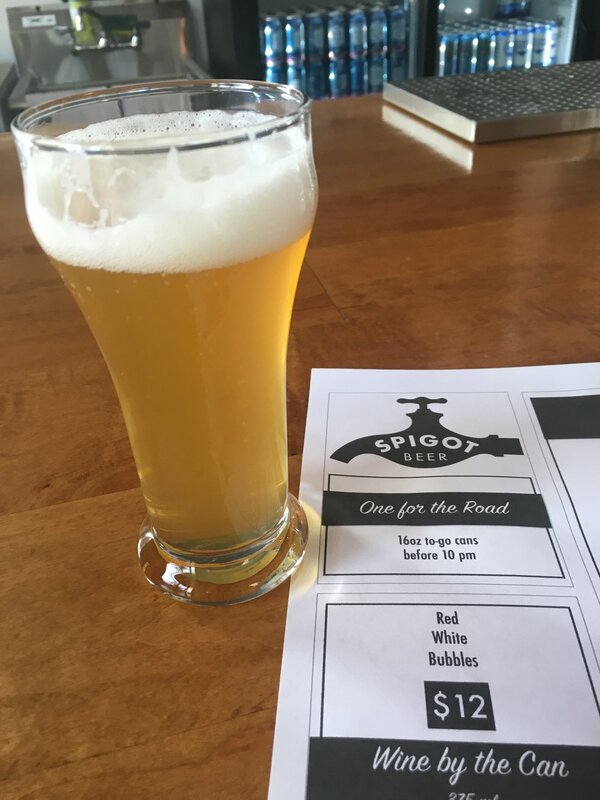 Currently, Spigot Beer is open Wednesday – Saturday from 4 p.m. – 12 a.m., and on Sundays from 4-10. They mentioned they might tinker with the hours in the near future, and will likely open taps on Tuesdays. To stay in the loop, check out Spigot Beer on Instagram, and on Beer Menus for an updated draft list.